An indigenous Mesoamerican myth describes the discovery and opening of a mountain filled with maize, capable of providing sustenance to the people of the world. Nonetheless, hundreds of years after this event would have occurred, we continue to hunger— physically, emotionally, spiritually. The images and text of this blog will relay my own quest to understand the world around me through observation and reflection on the people and places encountered during my wanderings— people also searching, in a variety of ways, to partake of life’s bounty. Here’s a photograph of my friend Gaby (from the Yagüita) as a young girl. She’s now in her 20’s and has two children and another one on the way. She’s very strong, and I’ve been told she can even hold her own with men if it comes to a tussle. Out of work for quite some time, she has resisted pressures and suggestions to make her way to the beach and service tourists. According to Gaby, her best opportunity would be to secure work at a local Timberland factory, but so far her applications have not been successful and she remains unemployed. Having known Gabby since she was a toddler, I trust her without reservation. She is someone I would turn to if I had a problem. I wish I knew how to help her with hers. Generally, I take many pictures of a given person or scene. It allows those around me to get used to my presence and also provides more opportunity to capture the essence of a particular moment. Sometimes, as a result, I end up with a surplus of usable photographs and have to pick the one I think is best. 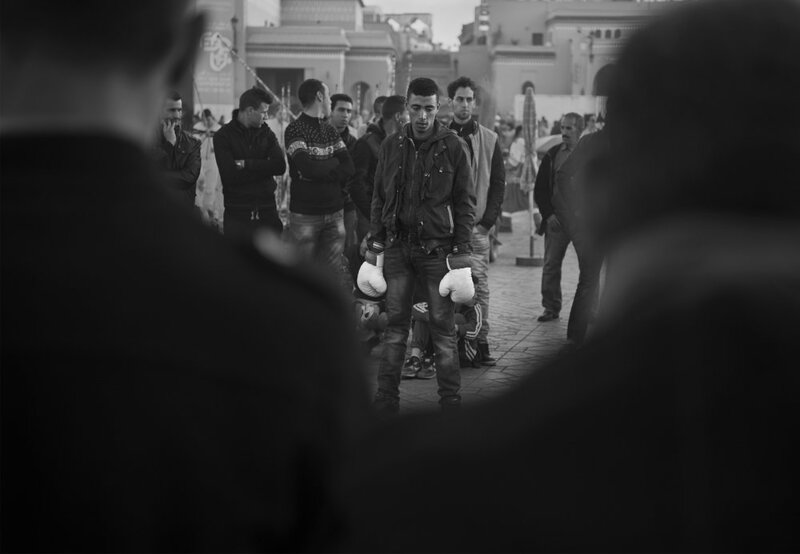 This is a photograph from Jemaa el-Fna, the public square of Marrakech, that I did not use in my Morocco portfolio, instead opting for one of children engaged in a sparring match. It was a hard choice as I really like the intimacy of seeing the young man seeming to reflect before a fight but ultimately I opted for drama. A writer friend of mine once told me that his creative process required him to be alone for extended periods, but that he was actually quite social. For me, it’s been the opposite; I came upon photography while searching for something meaningful to fill my inexplicable yet apparently congenital sense of separateness. When I look at this photograph, I remember feeling primed for adventure, excited at having just arrived in a new town where I didn’t know a soul. I felt a sense of purpose, rejoiced in the focus my aloneness allowed, and turned my eye toward the movements of people on the street and the decaying grandeur around me. I was there and I was alone for a reason: to take photographs like the one shown here. 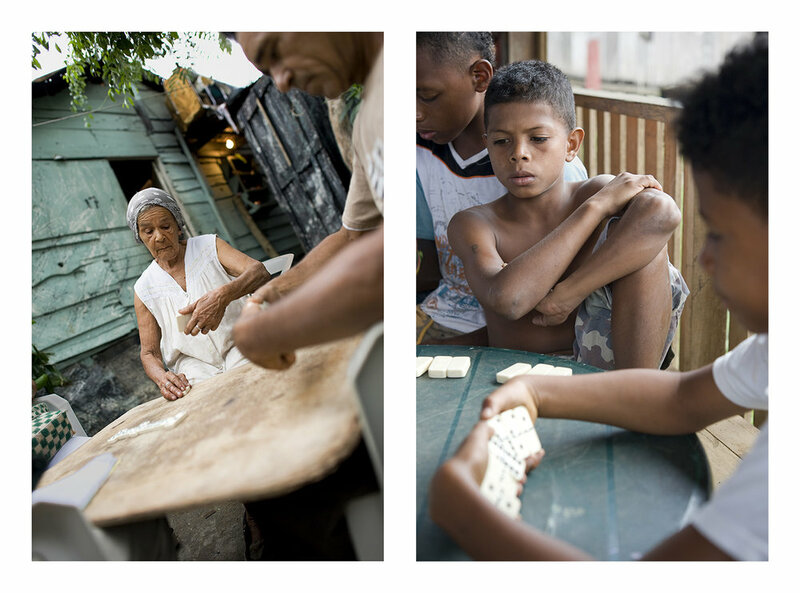 This triptych is of Yancarlo, a young man I have watched grow up in a barrio of the Dominican Republic. Since the last photograph shown here, he has had two children, lost a brother to violence, performed tremendous amounts of physical labor in construction, and is currently wishing he had a more plentiful stream of income. Yancarlo will move forward with his life, perhaps never completely understanding me nor I him. However, I do hope we continue to have portions of our lives intertwined and that I have the opportunity to see him raise his children and find joy. I’m not sure exactly how he thinks of me but I know that I will always wish him the best. Some years ago, a family member told me that the problem with my photographs was that she didn’t know who the people shown were and that she didn’t care… and she didn’t think many other people would either. Two decades later, I’m not only still taking pictures of the same types of people but even of the same individuals! This is Edward. He appeared in my book of photographs “Glimpses of La Yagüita” together with a text where he described his desire that people imagine him to be wealthy when viewing his image. We have continued our friendship as well as photographic collaboration as he passed through adolescence, became a man, took a job in the capital, had two children, returned to his mother’s home to replace the decaying wood walls and leaking roof with cinder blocks and zinc, separated from his wife, and fell into hard times during a period of unemployment. As a child, he had a vivid imagination and sense of adventure. Hardship and struggle are squeezing the glimmer from his eye, but he seems to have resisted the temptation of joining those around him in criminal enterprise. It may be that my family member was right, that no one cares who the people I photograph are - but I don’t think so. And I care. I’ve previously written about my wonderful experience with young monks in Ethiopia. 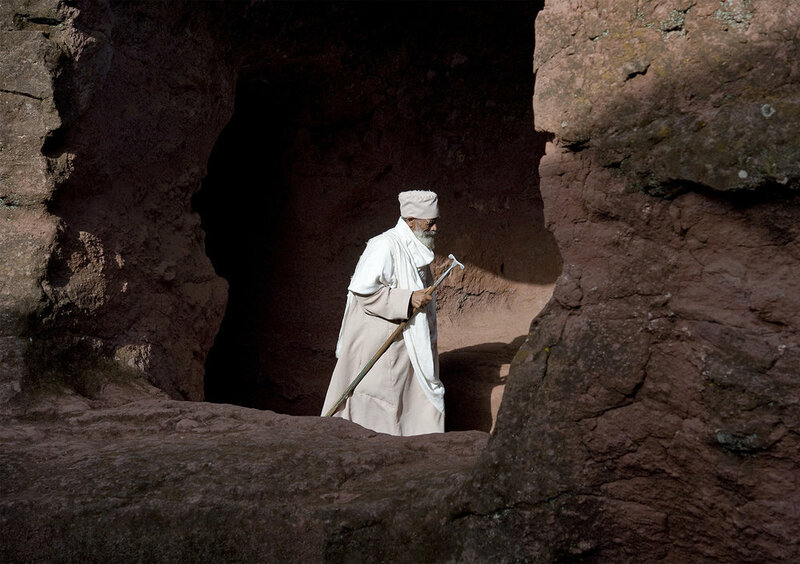 This picture is of an adult devotee walking in a rock-hewn church illuminated by the early morning sun. Like the centuries-old church he is aged and weathered, but moves with purpose and has a defined function in his religion. It must be particularly comforting to have a role and place in the world as one reaches the twilight of life. Surely, he has worked and struggled over the years to occupy it. The young man shown here had been raised from an early age by the elders on either side of him and was introduced to me as their son. He was fluent in the Emberá language and, as was apparent from the attention lavished on him by adult members of the indigenous group and the swarms of their children who surrounded him wherever he went, was much admired and beloved by the community as a whole. I had previously encountered Indigenous and Black communities along the Pacific coasts of Panama and Colombia living in close proximity, but while they generally mingled harmoniously, this was the first time I met an integrated family. Being part of a multi-racial, adoptive family myself, I found their deep affection for one another to be particularly beautiful. I’ve avoided tourist destinations consistently during my travels. There’s something about things feeling too familiar, too packaged that runs counter to the experiences I seek. It’s not pyramids or well-known landmarks that have beckoned me from my life in New York, but rather the quiet intimacy of meeting a stranger in a town plaza or being invited into a home for a cup of coffee. One afternoon in my early 20’s I randomly jumped onto a bus heading out of a small town in Veracruz, Mexico, where I happened to be spending a couple of nights. After an hour or so of looking out the window as we drove along a dusty road, I noticed a man sitting in front of a humble, cylindrically-shaped, one-room home. It had an opening only 4 feet in hight for a door, a thatched roof, rough-hewn wooden slabs for walls, and, as I remember, split coconut shells hanging from strings in the windows for privacy. I had never seen anything quite like it, and to this day am uncertain if it was traditional to the region or simply a whimsical creation. Intrigued, I jumped off the bus and retraced the empty road until I was in front of the dwelling. The man, perhaps 60 and clothed in a worn shirt and jeans, cowboy hat and huarache sandals, laughed upon seeing my interest in his home and invited me inside where his wife stood on the dirt floor making tortillas by hand and cooking them over a fire. After 20 minutes or so of standard conversation (Where are you from? What foods do you like? How many siblings do you have? etc. ), he looked up at me with a warm smile and said, “I know why you’re here. You’re wondering about my life, the way people in this area spend time, what our experience on earth is like. You want to know what we’re thinking, feeling… Well, we’re thinking and feeling the same things as you. We’re wondering why we’re here, what we should be doing, and what will happen once we cross over.” I responded with a nod, and a comfortable quiet filled the room. Not wanting to dilute the experience of our shared sense of humanity, I don’t think I even took my camera out of its bag. So here are three images of other places that represent the sort of environments I’ve been drawn to for my photographs. One is in Argentina, the next Ethiopia and finally Guyana. I liked all three places very much, but connections like the one in Veracruz are few and far between. I’m not claiming to be of similar calibre to the great master Vincent van Gogh, but his work did inspire me to take this picture, and when I look at it I think of his Portrait of the Postman Joseph Roulin. Mine is of an electrician. 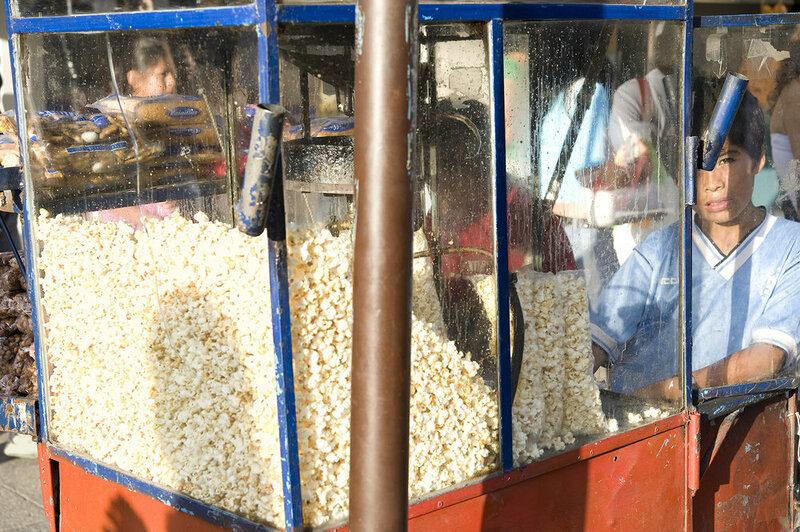 I was staying in a small mountain town in Jalisco, México, during my fifth birthday. Accustomed to games, cake and piles of presents, I remember feeling apprehensive as the neighborhood kids, invited or not, began arriving empty-handed and clearly more interested in the food Mom had laid out on a fold-up table than in paying their respects to the birthday boy. Most of the party has been lost in the fog of time, but one event remains vivid close to four decades later: the breaking of the piñata. I wish that I could say that blindfolded I had hit the piñata myself and account for my ensuing failure by an inability to see… but that was not the case. Rather, I was on the sideline when with a tremendous whack an older boy split open the papier-mâché donkey, sending candy showering to the ground. Diving for the bounty, I suddenly found myself at the bottom of a mound of struggling children. I felt myself being crushed, suffocated, and began to cry. What felt like an eternity later, the mass shifted and I felt an older boy I knew pulling me off the ground before he dove back into the fray. It seemed like even the smallest children had managed to emerge with their hands full of candy, but there I was, teary-eyed, without a single piece. This experience, as well as countless others since, have left me with an indelible admiration for the strength, tenacity and fortitude of the hardscrabble children of Latin America. Below, I have shared a few images of some of the types of children I am describing. But how did my birthday end? Unfortunately for me, from among the dozens of children only two gifts were produced - both of which upon being unwrapped turned out to be soap. As noted in my last post, when I am abroad, there is a tension between my reluctance to pass judgement on the people or cultures I’m coming into contact with and my personal reaction to activities I deplore. Cockfighting is one such activity. I find it sickening to see people force two live beings into deadly combat. Aware that my own status as an omnivore also links me to the deaths of many a bird, I do not have any pretensions of superiority when I express to those in the vicinity of the violence that I do not enjoy the bloodshed. Many locals turn out to share my feelings - but the fights have always continued as scheduled. They say that you can gauge a community’s prosperity by the condition of its dogs. But sometimes financial hardship has nothing to do with the suffering people inflict on their animals. On more than one occasion during my travels I’ve been horrified to discover that people I’ve known and even liked tether their dogs with short ropes just outside the backdoor, never walking, exercising, or releasing them. I once asked someone who kept his dog this way why he wanted to have an animal at all. His response was that the dog was his “alarm system”. I never again looked at him the same way. The dog in this photograph, however, was doing fine. He was part of a pack that moved freely on a street in La Yagüita (a barrio in the Dominican Republic), each dog marginally owned by a particular person or family but generally found lounging as a group. What I found most heart-warming was that a number of the dogs made their home with a man who lived on the brink of destitution but still chose to commune with his canine friends. Sometimes money just has nothing to do with it. I have not gotten used to (nor do I want to) violent death in the barrio. To learn that someone has suddenly ceased to exist is like seeing a flower uprooted by a storm - memories of the deceased like the damaged petals of the flower lingering in a fleeting, melancholic beauty. On my computer screen I see the bloodied bodies of the two living of four armed robbery suspects gunned down by police. A young friend of mine was one of the two who did not survive. His image, smiling and open, appears again and again across my FB “feed” as his community uses a digital platform to mourn. I exchange texts of sadness and remorse with his friends, his sister. In Central Park, where I walk after receiving the news, the Summer’s late setting sun casts its last rays onto fields where ballgames are taking place and families lay out on picnic blankets. It’s a different world from the neighborhood my young friend was born into and inhabited for the entire duration of his life. A world he only saw on screens. I wish he had been able to experience it - even just for a day. I can be quite reserved, and I don’t think I took pictures of anyone I didn’t already have a relationship with for the entirety of my Photograhy 101 semester. Instead, I learned to balance the shutter speed and aperture of my Pentax K1000 while producing self-portraits and images centered around architecture, shadows, lines, objects or close friends. Given that my initial impetus for wanting to learn photography was to communicate the polarity of the struggles and beauty of marginalized communities in Latin America, I eventually learned to approach strangers. But despite years of positive experiences and photographic outcomes gained by overcoming my social reticence, it remains a challenge for me to invite the participation of those I don’t know, and there are days when I revert to what comes most naturally and avoid people altogether. I don’t think those days have been wasted. 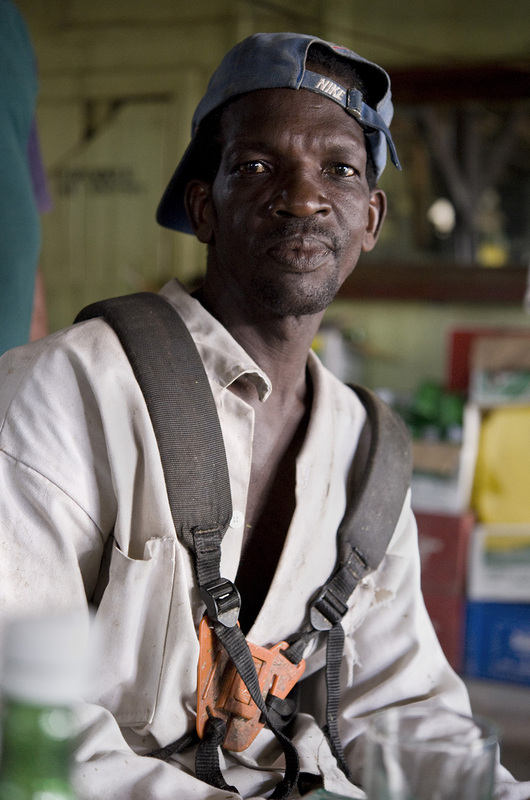 This is a particularly gritty spot in the gritty capital of a country composed mostly of pristine jungle, Guyana. Attracted to the architecture of the perhaps once desirable residence in front of me, I stood in front of a threadbare movie theater, camera in hand, mentally composing an image. Periodically, wretched-looking women, some with a baby in arms, would approach me and ask if I wanted to “see a movie”. It didn’t take long to understand the meaning of the invitation on my own, but a well dressed matron heading for church stopped to warn me that films were not the primary attraction of the cinema and that malarial mosquitos were known to take advantage of the love fest within. Focusing on the precarious dwelling shown here, I noticed an unusual amount of traffic, a slow but steady stream of derelicts entering and leaving. Word soon reached me, via a garrulous man who had stopped to speak to me of Guyana’s various attributes, that the building’s occupants were wondering what I was doing. He shouted, in a thick Guyanese accent, my response to a set of eyes half visible behind a curtain in one of the windows: “Admiring the architecture.” Not wanting to push my luck, I departed some minutes later. During my travels, it's always been special for me when I find someone with a dramatically different life trajectory and circumstance whom I share personality traits – really, more like a human essence – with. One of those people, Lalo, is shown here. Both of us sense it. We sit quietly together, watching the young men who disappear behind his house to get high, the children playing, the birds arriving to inhabit their roosts in the trees as evening approaches and when the sun finally sinks behind the shanties of the barrio. Occasionally, we’ll make jokes, reflect on the surroundings, on the people we see, on what it means to be growing older, or recount intimate details of our lives. Both of us have a tendency to drink to excess, love dogs, and share an amorphous sense of longing tinged with sadness. I have known Lalo for many years and still can’t quite make sense of how the two of us, one living in destitution and the other with abundance, managed to recognize one another as kindred spirits and develop a such a strong bond. Even in Amazonian towns that are accessible by boat alone, there can be substantial (local) tourism – which grows quite tiresome after the first half-dozen or so boat loads of selfie-snapping, garbage-tossing loudmouths. After a couple of nights in one such town, a local suggested I take an early morning boat 30 minutes up a tributary to an indigenous village unfrequented by tourists. I was told to ask for someone, upon arrival, whose name was pronounced “Hi-Kee,” to arrange lodging and meals. The following morning, seated in a 15-foot boat with an outboard motor, a local entrepreneur (whose business consisted of shuttling people to places not on the “main” route) navigated me through a spectacular flooded forest. Wet season at its peak, the waterline was just below the trees’ branches and we wended our way slowly forward between tree trunks, periodically being brushed by hanging leaves or twigs. Fish jumped, birds fluttered, and I imagined the larger mammals - jaguar, deer, puma, giant otters - listening to the purr of our motor in the distance. Upon arrival at the village, I disembarked and discovered a town of not more than two or three thousand inhabitants, living mostly in wooden structures scattered along dirt paths. The major landmarks were a couple of soccer fields (one concrete, the other a mixture of dirt and grass), and a wooden church. I set out walking in the direction indicated by the boatman as the place where I would find “Hi-Kee,” happy to be unencumbered by luggage (save the backpack on my back) on the uneven trail. Not sure what I was looking for or if the location would be marked, in the course of the next few hundred feet I asked several more people where “Hi-Kee’s” establishment was. I made my best guess as to which of the houses might be my destination and stepped timidly into the first floor living quarters of a well-kept lodging. Hearing my footsteps, a young indigenous man opened his eyes and raised his head from a hammock strung in the corner. In Spanish, I explained that I was looking for “Hi-Kee,” as I had been told that she could help me find room and board. “She is my wife,” the young man replied, and climbed a wooden staircase to find her. As I prepared to meet an indigenous woman who most likely would have learned Spanish as a second language, a tall, young, blond, smiling European woman descended the stairs. Here is a picture of José's youngest brother, Robinson, with traditional indigenous body paint. Heike and José were just outside of the frame… comfortably chatting with a half-dozen or more family members. I took this photograph twenty years ago. 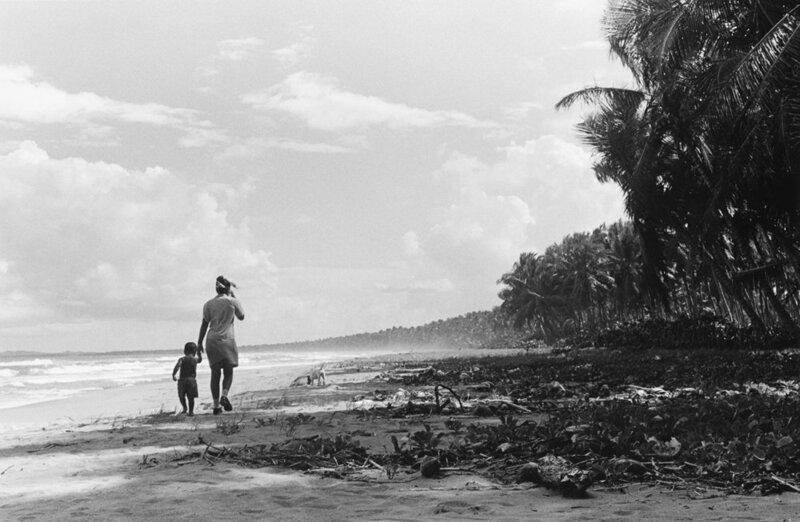 It was early in the morning and the beach was empty, save for these children, their dog, and myself. Since I had come out of my cabaña after they passed, I don’t think that they ever noticed me. I remember feeling the timelessness: the salty scent of the ocean air; the rumble of the waves; the rustling of palm leaves in the wind. I also remember recognizing how the time of day corresponded with the stage in life of the children walking in front of me. I miss that period of my life - the feeling of freshness, and, like the pair in the photograph, having more before me than behind. Yet I’m happy to still be here, alive and able to recreate the experience, after all these years, through writing and an image. I knew Delvis, the young boy shown here, for years both before and after this photograph was taken - from when he was a toddler until his late teens. Some months ago, I received word that he was gunned down in his barrio. With violence, crime and murder on the rise in his native Dominican Republic, his death saddened many but came as no surprise. There’s something wonderful about an activity like dominoes that appeals to people of different ages and can be played throughout a lifetime. Possessing only a vague understanding of strategy, I once substituted into a game and serendipitously helped my partner win two important rounds. Not wanting to commit to any more time at the table while the amber light of late afternoon provided for photographic opportunities, I vacated my chair and was on my way. I don’t remember if I succeeded in my efforts to find images that afternoon, but I do recall with pleasure the camaraderie of a winning streak! I won't share your e-mail. Ever.